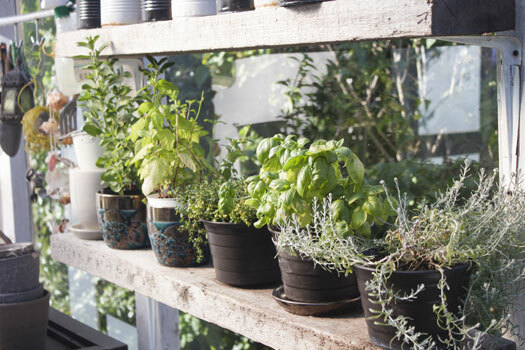 Growing an indoor herb garden adds natural vibrancy to any Downtown San Diego loft, condo, or penthouse, and keeps fresh culinary delights at your fingertips. Here are indoor growing tips to keep your herbs beautiful and healthy. Most herbs enjoy a lot of light, and this is the first thing you should consider when setting up your indoor garden. Choose the sunniest place in the sunniest room. It should receive at least six hours of light each day but more sun is better. Set the herbs that need to most light, such as thyme and oregano, closest to the windows. Low-light herbs like chive and parsley can be placed a little further away. Avoid setting any herbs directly against the windows, however, as heat from the glass and magnified sunrays can scorch the foliage. Most herbs don’t mind a little crowding, but try to set the plants far enough apart that air can flow between them. This reduces the risk of mold and other fungi growing on or near the plants. Potted herbs need potting soil that provides excellent drainage. Soil that is too sticky and dense won’t allow water to drain well enough and this can contribute to root rot and other plant problems. Most herbs like to be kept slightly moist, but few do well in soggy soil. Most pests on indoor herbs can be removed by hand or by squirting plant foliage with water from a spray bottle. Diseased leaves should be removed as soon as you spot them to prevent further spread of the problem. Herbs are easier to grow than some plants, but you must tend to your garden daily. Set up calendar reminders to keep on top of watering and fertilizing and look for pests or disease each time you water. The more care you give to your herbs, the more you should get in return. Buying Downtown San Diego real estate doesn’t mean forgoing greenery, it just means getting creative. In addition to an herb garden, many locals take advantage of succulent container gardens, vertical wall gardens, or get creative with their balcony or patio space. For help finding the right Downtown San Diego penthouse, condo, or loft, reach out to the area experts at 92101 Urban Living at (619) 649-0368. We specialize in Downtown San Diego neighborhoods, including Little Italy, Marina District, East Village, and Gaslamp.